80 Agile Links Right Here on Agile Advice! 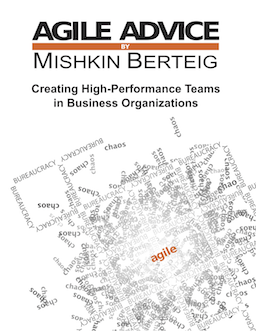 Did you know the “Agile Resources” page on this blog has 80 links to valuable Agile Resources compiled by Mishkin Berteig? The page contains a number of links to recommended web sites, books or tools relating to Agile Work. It’s updated from time-to-time and as this is done, announcements are posted on the Agile Advice blog. As such, this page will always be “under construction”. If you have links to suggest, Mishkin will examine them for consideration. Please feel free to post suggestions. We’d love to read your comments and ideas! Thank you Vik! Glad to hear you like the list.